Jan Sepp (1778-1853) is who we have to thank for this stunning atlas moth illustration. His work, Papillons de Surinam features a whole gallery full of beautiful colored butterfly and moth illustrations. Along with his father Jan Christiaan Sepp, they published and illustrated several natural history works. Unlike, a previous atlas moth drawing that was in black and white, this moth drawing is in full color. I took a bit of creative license when removing the background of old yellowed and foxed paper, I added a brown mottled background to really set off the pretty colors of this moth. Atlas moths are among the largest moths in the world. Sadly, they only live a few days once they reach the adult stage. But, oh, for those few days what a show of color and grace. 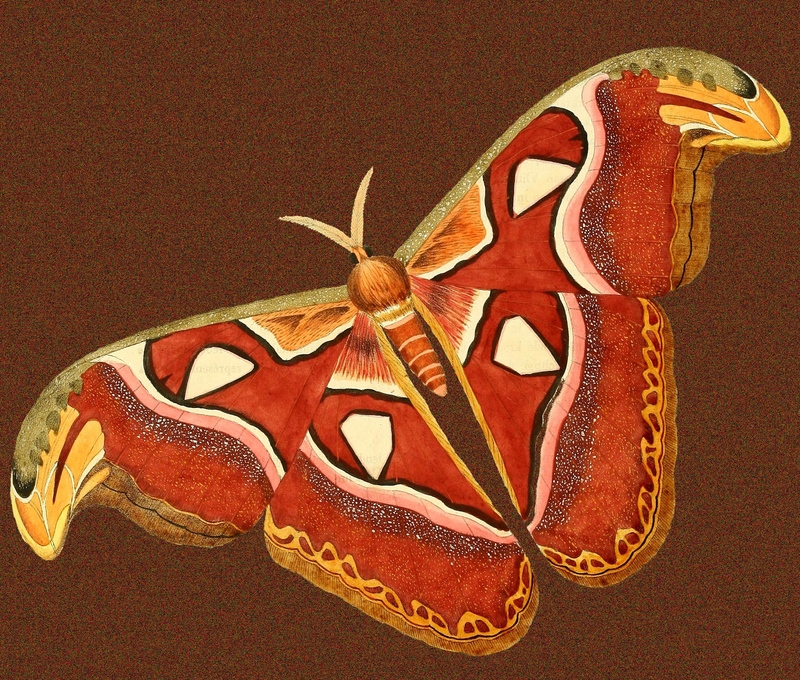 Like this atlas moth illustration? Just click on it to see the full-sized version.